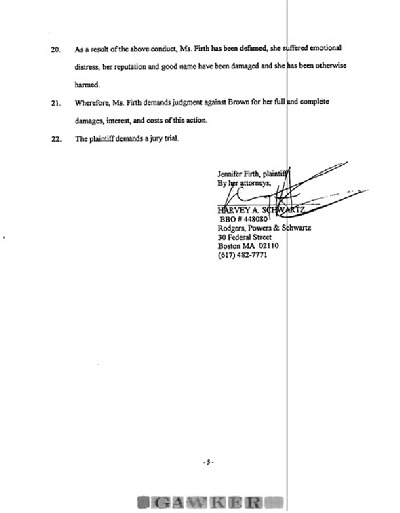 Did you know that Scott Brown—the new star Republican Senator—was accused of harassing a female campaign worker in 1998? 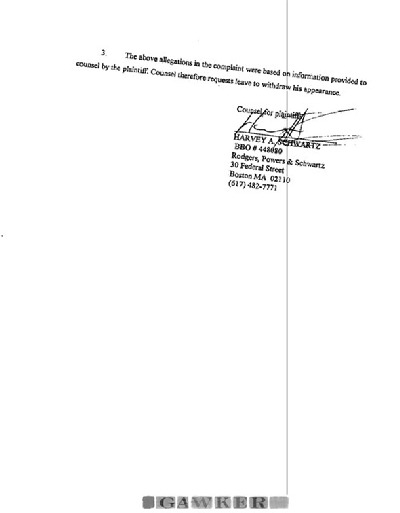 We have the documents to prove it. Did the Democrats blow an opportunity to keep their 60th Senate seat?In 2000, Scott Brown was a freshman state representative in Massachusetts. A few years earlier, he’d served on the Wrentham, Mass. Board of Selectmen. 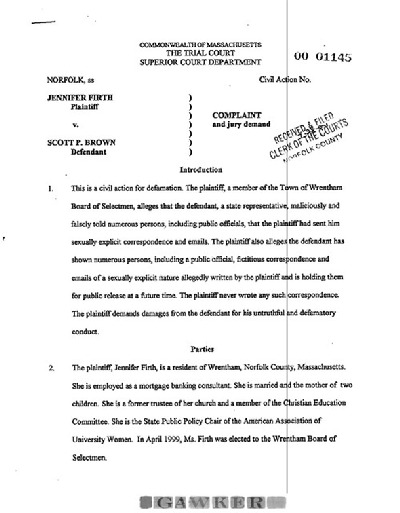 Jennifer Firth, a local mortgage banker who was elected to the Board of Selectmen in 1999, filed a civil defamation suit against Brown in July of 2000, alleging that he had harassed her when she worked on his campaign in 1998, and then tried to smear her reputation around town with forged letters and emails. Firth’s story is certainly an odd one. 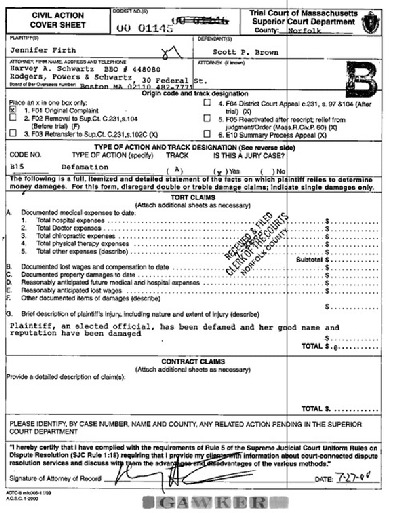 Why would she have gone to the trouble of filing a suit against Brown only to drop the case so soon afterward? 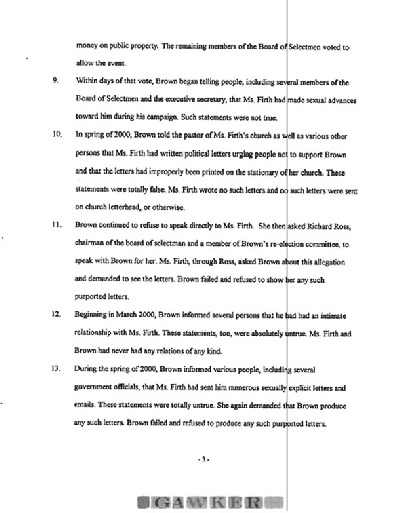 And if Brown had any evidence to support his claim that it was Firth who had been harassing him, why did he never release it publicly? To be sure, it’s possible there was no merit to Firth’s case. And it’s worth noting that Firth has had other brushes with controversy in her county. 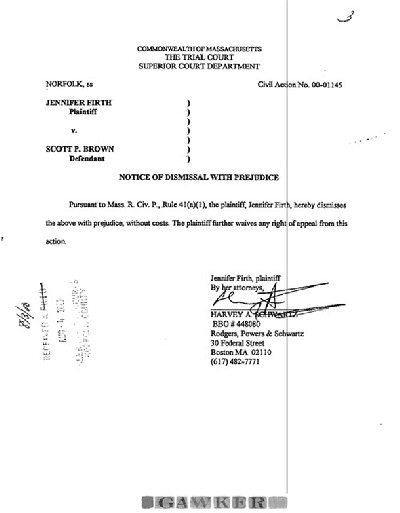 But why did Democrats and members of the national press fail to even bring up the fact that Scott Brown had once been accused of sexual harassment and defamation in the myriad stories about him prior to Massachusetts’ special election in January? Google it. The entire incident is conspicuously absent. Consider the political stakes. Coakley’s loss cost Democrats their 60th Senate seat, endangering a long list of President Obama’s political objectives such as health care reform. Yet Martha Coakley, the state’s Democratic attorney general who ran against Brown, never mentioned the issue on the campaign trail, as far as we can tell. 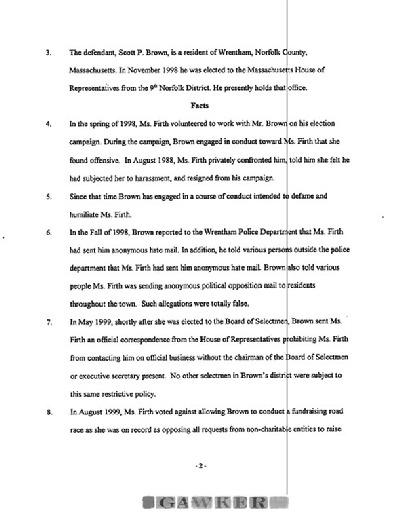 Did the Coakley campaign look into the case and decide Firth’s claims were baseless? Did they miss it entirely? The Democratic leadership in Washington did not, as far as we can tell, raise the harassment claim at any point during the election, even though it could have been used to raise doubts about Brown in the lead up to what was a very close election. Firth’s charges may have been baseless. But many politicians have seen their political prospects damaged by far less than allegations contained in an actual lawsuit. Why didn’t White House chief of staff Rahm Emanuel feed this to liberal media outlets in an effort to discredit Brown? Clearly, if the situation were reversed and it had it been a Democrat in a high-profile special election who had a harassment and defamation suit in his past, the story would have been a talking point on Fox News for weeks. We’ve left messages for Senator Brown, Jennifer Firth, and her former lawyer Harvey Schwartz. We’ve yet to hear back from any of them. Sexual harassment (#4) was a private matter. But conflict escalated when Firth ran for office. By 2000, Firth and Brown were engaged in hardball politics... with a thinly veiled motive. 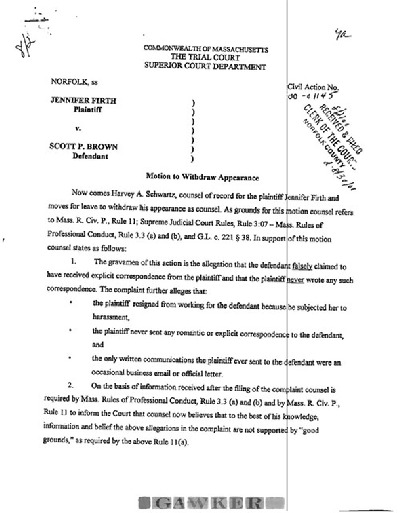 The conflict came down to a stack of explicit letters that Brown allegedly would not reveal. The scene was set for a scandalous jury trial. And the case was closed. Which makes you think, why the sudden turnaround? And why did this story never make it to the MSM?